555 S. 10th Street, Omaha, NE, U.S.A. This all-suite property is situated in the Old Market downtown area among shops and restaurants. This hotel is well suited for both business and leisure travellers looking to explore the Old Market area on foot. Both smoking and non-smoking accommodations are available. All rooms include separate living and bedroom areas, a TV in each room, a sofabed, a desk, a wet bar, a mini-fridge, a coffeemaker, a microwave, an iron and ironing board, a hair dryer and individual climate control. Premium suites also include a refreshment centre, free Wi-Fi and a docking station. Accessible rooms are available. Wi-Fi is available in standard suites for an additional fee of $10.95 per 24 hours. Self-parking is available on site for an additional fee of $10 per day, while valet parking is available for $16 per day. Pets are not permitted. A free cooked-to-order breakfast is served from 6 am to 9 am on weekdays and from 7:30 am to 10:30 am on weekends. Free snacks and beverages are available in the evenings. The on-site Falling Water Grille and Bar serves dinner and room service in the evenings beginning at 5 pm. Other on-site amenities include a business centre (which includes mail and notary public service), meeting space, an indoor pool, a fitness centre, an ATM, baggage storage, a gift shop, laundry service, a convenience store, a news stand and safe deposit boxes. The Durham Museum is 5 minutes away on foot. Bemis Center for Contemporary Arts is a 6-minute walk away, while the CenturyLink Center and the TD Ameritrade Park are both about 15 minutes away on foot. The Children's Museum is about a 16-minute walk away. The Civic Auditorium is about 20 minutes away on foot. Verified by a front desk agent on October 15, 2013: Free breakfast hours and Wi-Fi fees. Among the reviews used for this analysis, many guests found the location convenient for walking to shopping and dining in the Old Market area and downtown attractions. The staff were frequently complimented for their friendly and accommodating service. One guest mentioned, "it was a busy weekend so our room was not ready, so the staff upgraded our room so we [got] to check in right away." Several guests praised the food at the free cooked-to-order breakfast, while one reviewer enjoyed the free beer and wine at the evening reception. Many reviewers found their rooms generally comfortable, while several guests added that their rooms were clean and spacious. However, there were also many complaints about wear and tear on the rooms (see below for more details). Many guests thought that their rooms appeared dated and in need of upgrades. One reviewer described his room as dingy and dark, while a couple of guests agreed that the carpet was in need of stretching in places. A few guests complained about paying additional fees for Wi-Fi ($10.95 per 24 hours) or parking ($10 to $16 per day). A couple of reviewers thought that the room rates were expensive and that this hotel did not offer good value for the money they spent. Expedia.ca gave this hotel an average score of 4.5 out of 5, with 94% of 114 guests recommending the property. 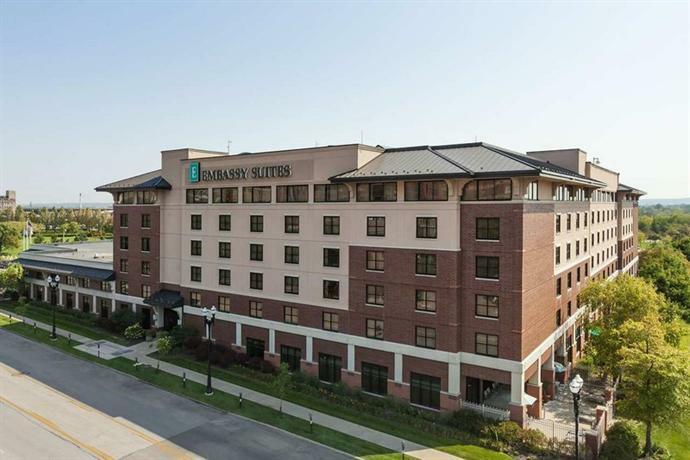 TripAdvisor.ca ranked this hotel #18 out of 70 hotels in Omaha, with an average score of 4 out of 5, from 277 reviews. The author called the hotel on October 15, 2013 to verify some information. Rating: #10 out of 71 hotels in Omaha ranked by guests.